Erasmus University Thesis Repository: What keeps potential audiences from attending? What keeps potential audiences from attending? This study examines the group of non-attenders of classical music concerts. 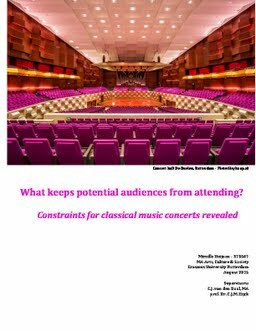 To date, this group has not been studied, but if classical music concerts (of Rotterdam Philharmonic Orchestra) want to attract more and new audiences, it is important to understand what kind of constraints they experience for not participating in such concerts. Founded in existing theories on constraints in leisure, indicated by Kelly & Godbey (1992) and refined by Kay, Wong and Polonsky (2009), it has been explored to what extent constraints are recognized among non-attenders in Rijnmond region. Via a mixed method approach, it has been discovered that several (themes of)constraints are detected among the group of highly educated non-attenders. Indicated as a most mentioned constraint, is it just didn’t happen. This broad constraint functions as an umbrella for other constraints, such as the fact that people are not used to it because they have not come in contact with classical music concerts. Another explanation for it just did not happen, is associated with phase of life people are in. Especially the people that are part of a family with young children, see no priority in attending classical music concerts. Another aspect that should be related to this constraint is that respondents are not fond of planning activities ahead. They tend to rather participate in cultural activities that can be decided upon on a short notice. At the same time, the constraint it just didn’t happen is seen as a weak excuse. Another constraint-theme has to do with the atmosphere in the concert hall. People perceive the conventions that apply as strict and not appealing because of the formal context. Furthermore the atmosphere in the concert hall is seen as boring, especially when compared to open air concerts people know about. Examples of Kings Day and Liberation Day are seen as more positive ways of presenting classical music. Classical music itself is perceived as beautiful music, which would therefore not be considered a constraint. According to the least experiences listeners of the sample, knowledge to experience classical music is not needed, although the more personal information about composers is appreciated and seen as enriching. The more experiences listeners value more technical information about the music. To them knowledge makes it easier to fully comprehend music. This difference needs in knowledge affects how information about concerts of Rotterdam Philharmonic Orchestra is perceived. Information about their concerts is noticed, but not always appealing. Not appealing because people do not feel addressed, or because the information does not relate to existing knowledge. Implications of this study are that non-attenders, the so-called prospects have come to known better. Broad themes of constraints have been indicated as applicable to this group.